Tuna is a great option for those that don’t like their fish too ‘fishy’ as both the texture and flavour is lovely and meaty. 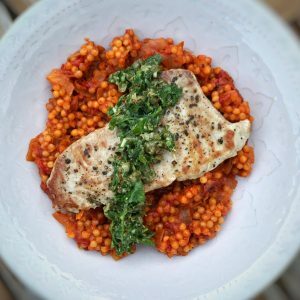 The herby gremolata which tops the tuna gives this dish a lively and fresh finish and the tomatoey cous cous is not only full of flavour but lovely and filling. A lovely summery yet satisfying dish for only 6sp. The gremolata prepared as below can also be used as a finishing topper to liven up roasted veggies. It’s so simple to make and really lifts the flavour of anything it’s added too. The recipe below serves 4. If you are only making this for two people I would still make enough cous cous for 4 as it’s the perfect thing to box up and add to a salad for a packed lunch the next day. The points would stay the same as the tuna is 0sp. Begin by making the cous cous. Take a large frying pan, spray with 1kal and add the onion. Fry for 5-7 minutes until it starts to soften (add a little water if the pan gets too dry). Then add the peppers and garlic and fry for another minute or two. Add the paprika, oregano, cumin and crushed chillis, fry for another minute and then add the chopped tomatoes and half the stock. Season with salt and pepper. Add the cous cous, stir to combine and bring to the boil. Once boiled, lower the heat to a simmer and cook for 8-10 minutes until the cous cous is cooked and the majority of the liquid has absorbed into it. Keep an eye on the cous cous as it is cooking and add more stock where required to keep it moist and cooking throughout. Keep the cous cous warm on a low heat one cooked, whilst you finish everything else. Just before serving add the pesto, parmesan and lemon juice. Stir to combine. Whilst the cous cous is simmering you can make the gremolata. Add all the ingredients to a food processor, pulse a few times and then pop into a bowl and into the fridge until required – it’s that easy. For the tuna, brush both sides of each steak with olive oil, season with salt and pepper and then add, to a hot non stick frying pan. Fry for 1-2 minutes on each side (I like mine pink in the middle so I do one minute on each side, if you like it cooked through, give it 2-3 minutes on each side). To serve, take a bowl, add the tomato cous cous to the base, pop on the tuna steak and then top with the herby gremolata. Serve with a ½ slice of lemon per person. Hi are the chopped tomatoes tinned or fresh? This was amazing, Thank you. Still have lunch for next two days to look forward to!